This remarkable gold cross pendant from Apples of Gold will bring you back to simpler times and a simple, pious faith. 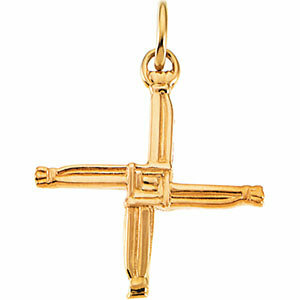 The St. Brigid's gold cross pendant is masterfully crafted of 14K yellow gold for a classic style. St. Brigid's cross features a woven look that comes to a square in the center. Each arm of the cross is also textured like it's woven and then tied at the ends. This pastoral cross is a perfectly lovely emblem to wear every day as poignant reminder of Christian faith. 20mm x 20mm (Just over 3/4"). We guarantee our St Brigid's Cross Pendant, 14K Gold to be high quality, authentic jewelry, as described above.